1. Combine butter, sugar, eggs, walnuts, sultanas, maida and baking powder in a bowl. 2. Beat until well blended. 3. Spoon half the mixture into a greased round cake tin lined with parchment. 4. 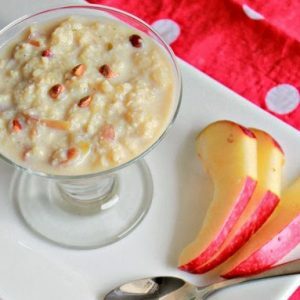 Add the apple and cinnamon. Spread evenly. 5. Spoon the remaining mixture on top and sprinkle with light brown sugar and walnuts. 6. Place the in a preheated oven at 180C for about 1 hour or until the cake is well risen and golden brown. 8. Remove the parchment and dust with icing sugar. 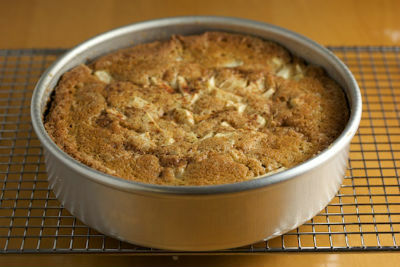 Feel free to comment or share your thoughts on this Apple and Cinnamon Cake Recipe from Awesome Cuisine.